MUMBAI: Actor Kajol and interior designer Gauri Khan shared pictures from their recent meet up at the latter’s store in Mumbai on Monday. Kajol, who has worked with Gauri’s actor husband Shah Rukh Khan in several films, praised the store and the hard work Gauri put into it. 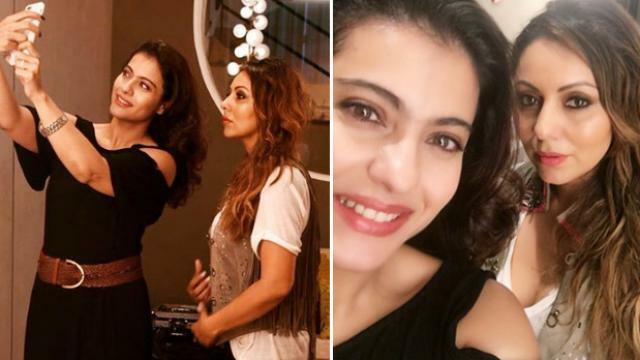 Kajol shared a picture of the two, looking stunning as the actor attempts to click a selfie. “Even the coffee echoes in this wonderfully done place ;). Kudos @gaurikhan . Chic !,” she wrote as the caption. Gauri thanked her for her kind words and posted more pictures from the day, one of them is the selfie that was clicked by Kajol. “Was good catching up today @kajol! Thanks for dropping by… ,” she wrote as the caption. Thank u Sanjay, for appreciating #gaurikhandesigns coming from you is a real compliment.